Join us at The SHOWTIME House at Clive Bar on Rainey Street for a three-day party to celebrate Original Series SMILF, THE CHI and SHAMELESS. We kicked things off on Thursday by bringing Southie to South By in honor of SMILF with a kickass lineup of all-female bands, a custom button-making station, and a special appearance by Golden Globe® nominee Frankie Shaw. On Friday, catch the vibe of THE CHI with performances by Chicago hip-hop artists including Joey Purp and an epic DJ set by DMC from RUN-DMC. Sample some South Side flavor with food from Harold’s Chicken Shack, a fresh sneaker gallery and a Chicago art wall. Saturday is gonna be SHAMELESS. We’re throwing a St. Patrick’s Gallagher’s Day Party not to be forgotten – or remembered if you’re Frank Gallagher. Join special guest bartenders Steve Howey (Kevin) and Shanola Hampton (V) for drinks, dancing and debauchery. Showtime will have a complimentary valet bike service near the Showtime House for Austin B-Cycle riders. While on Rainey, stop by the SHOWTIME Swag Shop to get FREE merch all three days. Don’t have Showtime yet? 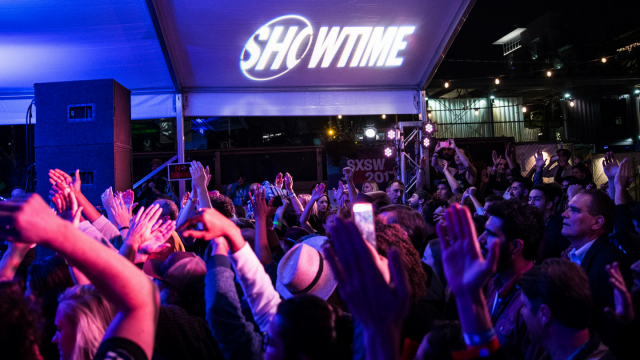 Start your extended 30-day free trial with code “SXSW18” at getshowtime.com.